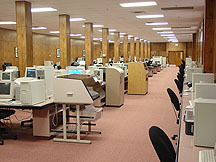 The American Action Fund for Blind Children and Adults supported the establishment, and continues to support the ongoing operation, of a comprehensive evaluation, demonstration, and training center, complete with over $2.5 million worth of nearly all of the tactile and speech output technology now available to the blind. Since its inception in 1990, this center has served as a rich resource for vendor-free advice on all aspects of Braille and access technology. This consultation is available for individuals, employers, rehabilitation and education professionals, and technology developers, thus better ensuring that the consumer perspective is represented and technology choices are the best for each blind person. This important resource is located at the National Center for the Blind in Baltimore, Maryland.